This project is run by the Sydney Albion Venturer Group, a group of Scottish vintage vehicle enthusiasts formed to repatriate and restore an Albion Venturer CX19 double decker bus, the chassis of which was built at Scotstoun, Glasgow in 1946. This is the first project in Scotland supported by the Heritage Lottery Fund to restore a bus. So what’s so important about our particular bus? Well, it fills a very important gap in the ranks of preserved buses in Scotland and the story goes back over 100 years. Albion Motors Ltd. of Scotstoun, Glasgow was established in 1899 and quickly became Scotland’s most important commercial vehicle manufacturer. They made lorries and buses which sold in greater numbers overseas than they did in their own country. By the 1940s Albion manufactured an extensive range of lorries and buses, all with Albion running units and a choice of Albion petrol or diesel engines. Indeed no other UK manufacturer could match the range which Albion produced, even though companies like Leyland and AEC had twice the output. Realising that such an extensive range could not be sustained, Albion decided in the late 1940s to withdraw from the double deck bus market, once current orders had been fulfilled. The Venturer CX19 had been introduced in 1938 with a choice of Gardner or Albion diesel engines, but after the war only Albion engines were offered. Around the time of Albion’s decision to stop production of double deckers, the CX19 had just been replaced by a newer model, the short lived CX37. Therefore, with a production life spanning 11 years, interrupted for 4 years by the Second World War, the Albion CX19 became Albion’s longest lived and most successful double deck chassis design and more popular overseas than in its home country. Two cities ran sizeable fleets of these buses – Glasgow and Sydney. By 1961 all of the Glasgow examples had gone, but in Sydney they remained in service till 1971. And then some went on to provide even more service with independent operators. One such bus was m/o 1877, chassis number 60023C, which was one of 30 Venturer Sp.CX19W chassis ordered by the New South Wales Department of Government Transport on 21st May 1946 for delivery before 7th November 1946. 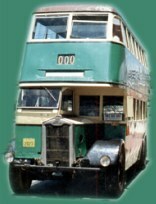 In Sydney it was fitted with a 59 seat steel framed body by Commonwealth Engineering of Granville, being later converted to 61 seats by the removal of the canvas front door. It entered service in 1947 and was allocated fleet number 1877. It joined the largest fleet of CX19s in the world, which, by 1949, numbered 143, in addition to 17 pre-war examples with Gardner engines. It was last overhauled in 1966 and was sold in 1970 to a succession of independent operators in New South Wales, being finally withdrawn in 1981 after an impressive 34 years service. It was then acquired by Australian preservationist Bruce Pinnell, from whom this Group acquired the bus in February 2004. At present there are some 350 preserved buses in Scotland, representing a wide range of various types which ran in public service during the last century. Unfortunately no examples of the Albion CX19 operated in Scotland have survived. However, with the repatriation of a CX19 from Australia, a very important gap has now been filled in the ranks of preserved buses. It’s an example of a fine piece of Scottish engineering from a time when Scotland was renowned for its engineering excellence throughout the world and with the help of the Heritage Lottery Fund, the public will soon be able to ride once again on a type of Scottish built double decker not operated here since 1961.